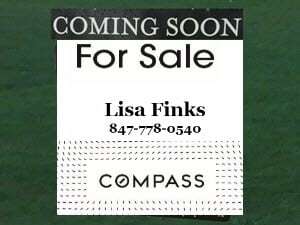 Why List Your Home With Lisa Finks? An educated seller is a successful seller. No need to dive deeply into the legal and regulatory complexities of the transaction (after all, that is why you are hiring a Realtor in the first place), but you should have general familiarity with the process (it is constantly changing) and an expectation of what a highly trained and experienced Real Estate Broker can do for you. This report provides essential information to consider when hiring a real estate professional. I hope that after reviewing this information, you give me the opportunity to serve you in the sale of your home. Responsiveness: When you first make contact, note how quickly an agent responds to your outreach. A top agent recognizes the importance of quick follow up with prospects and requests – if the agent is not responding quickly to you, why will they respond quickly to a prospective buyer? I make it a point to respond quickly to all email and telephone calls during business hours (and very often outside of business hours too). Retargeting ads are the latest technological advance for sellers. stand out in the crowd. Every agent has his or her personal selling system and there are vast differences among those systems, even for agents at the same brokerage firm. Our world is changing fast so I constantly seek out and educate myself on the most innovative technology available. While technology is important, I feel it essential to mix traditional print marketing methods along with high-tech internet strategies. To maximize exposure to the greatest number of potential buyers, I target both individual buyers and Realtors (who have access to the most qualified buyers). If you would like a detailed list of some of the marketing strategies I employ for my sellers, click here. Contract to Close: A top agent will make the selling process as easy as possible for you from the signing of the list agreement all the way to the closing and beyond. Evaluate whether your agent views you as just another transaction or whether they have the resources to simplify your life during the selling process. Will they slap a lockbox on your home, ask you to turn on the lights and then allow the buyer to stumble around your home, hopeful they notice its wonderful features? I make it a point to accompany nearly all showings to ensure that every potential buyer sees each special feature in your home and has every question answered. Accompanied showings also provide peace of mind so you know that buyers are not left unaccompanied in your home at any time. Feedback from every showing is equally important to monitor and assess future strategy. While the actual selling and showing of your home is the main event, the ancillary details are just as important. You may need referrals for organizers, packers, painters, handymen, movers, etc. I have a team of trusted preferred professionals ready to assist with all aspects of your move. View my list of preferred vendors here. I welcome the opportunity to make all aspects of your upcoming home sale as easy as possible. Pre-Market: A top agent begins selling your home the moment you sign the list agreement. Evaluate whether an agent has access to pre-market resources and is using them. Utilizing off-MLS network opportunities creates a buzz and generates excitement for your home. Pre-marketing also allows for testing of pricing and staging decisions (e.g., should you remove that moosehead from the wall or not?). Pre-marketing a home with “coming soon” helps it sell faster and for a higher price. After signing the list agreement, I launch my six-point pre-marketing plan. Utilizing targeted Facebook ads, the @properties agent network, North Shore exempt lists, Top Agent Network, off-MLS and more, these pre-market strategies not only provide extra bang for your buck but provide important strategic information for when you go live in the MLS. Preparation/Staging: With the advent of HGTV and many of the reality TV home shows, buyers’ expectations have skyrocketed. Buyers expect a showpiece and research supports that a staged home will sell for more money and more quickly. While it is not practical to make your home look like the cover of House Beautiful (after all, you do need to live there! ), it pays to stage the home to some degree. According to NAR, 87% of buyers use online sites to view home photos, thereby making the internet viewing your “first showing.” Your home must look its best online. High quality photographers capture the essence of your home with stunning photography as part of my service package. Upon signing the list agreement, each of my listings receives a complimentary consultation with a professional home stager who will prepare a full report for you with suggestions on what can be done, using your own furnishings and a bit of elbow grease, to make your home camera-ready to garner top dollar. After staging preparation and as part of my service package, I hire only the top photographers in the industry to capture the essence of your home with stunning photography. “Buyer-Hunting”: It really does only take one! Your agent should leave no stone unturned when identifying potential buyers. Creative marketing and intense networking help find more buyers! I try to reach individual buyers directly through aggressive print, digital and other marketing efforts. I also work hard to identify agents currently working with relevant buyers. Reverse prospecting is one method I employ, as well as some other advanced methods. I want my seller clients to have every advantage in the marketplace and believe my unique “buyer-hunting” strategies result in a greater pool of potential qualified buyers for their properties. These unconventional methods also provide additional options for the homeowner desiring privacy with an off-MLS listing. Don’t Use a Discount Agent: The sale of your home is a major financial transaction. An agent dedicated to the sale of your home will spend more time and marketing dollars to create better appeal, attract more attention and garner a higher sale price. A discount broker’s model is a higher volume model, allowing for less time and fewer dollars spent advertising and nurturing your listing. In fact, hiring a discount broker for possibly 1%-2% off of the typical commission price, could cost you double if an experienced and dedicated agent could have produced a 5%-7% higher sales price. For more information, see this excellent article, “The Myth of Lower Commissions – How Lower Fees Actually Cost Sellers Money,” by Steve Shull. For every home I list, I launch a unique and detailed marketing plan. I invest my own personal money and time to present your home in its very best light so that it can attract the greatest number of potential buyers. At a time when many agents are cutting back on their marketing dollars and throwing lockboxes on the front door, I accompany showings, network with other agents, utilize professional photography, create traditional print campaigns and engage in internet marketing to capture every potential buyer for you. Local Experience: In every community there are nuances among neighborhoods, even among blocks! Using a local agent ensures that your home is priced appropriately for its area. 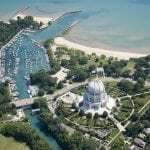 A local agent also guarantees that your prospective buyers will learn about all of the wonderful parks, schools and neighborhood amenities. After all, buyers seek a lifestyle beyond just a home. Not only will a local agent provide a better strategy for attracting buyers, they are nearby so it is easier for them to accept requested showings and pop by for questions or issues that may arise. I live on the North Shore and know its streets, neighborhoods and schools first-hand. 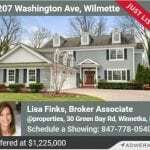 I live on the North Shore will only accept listings in Wilmette, Winnetka, Glenview, Kenilworth, Northbook and Evanston. I want to ensure my clients have the very best representation and I cannot adequately service listings out of this area. If you do have a home you would like to sell in another area, I have a network of professionals throughout Chicagoland and the US to which I can refer you. 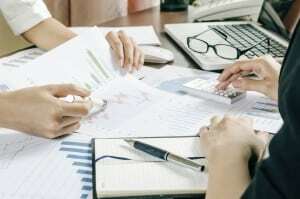 Comparative Market Analysis (CMA): Make sure you receive a complete comparative market analysis of your home. This analysis should consider pending sales and recently sold homes near your own which have similar features and size. Since markets fluctuate, comparable sales within 6-12 months’ time are most relevant. If your home is unique, older comparative sales can apply. Do not make the mistake of hiring the agent who suggests the highest list price for your home. Sometimes agents will agree to any price just to get your business. I believe in the power of statistics and data as predictive for selling your home. I take the time to research and prepare a detailed analysis of past comparable sales, cancelled listings and active homes that represent your competition in the marketplace. I will provide you with evidence as to why a pricing suggestion is being made. Since homes on the North Shore can be very unique, I can also coordinate a “pricing party” with fellow agents to elicit more data. Through it all, I recognize that this is a conversation between seller and broker, Different circumstances can support a more or less aggressive listing price. To view closed sales near you, click here. To request a CMA, click here. Communication: Communication throughout the process is essential. Nothing is more stressful than not knowing what is going on. I am your gatekeeper, you will receive regular communications from me regarding all showings as well as reports regarding the results of our marketing efforts.